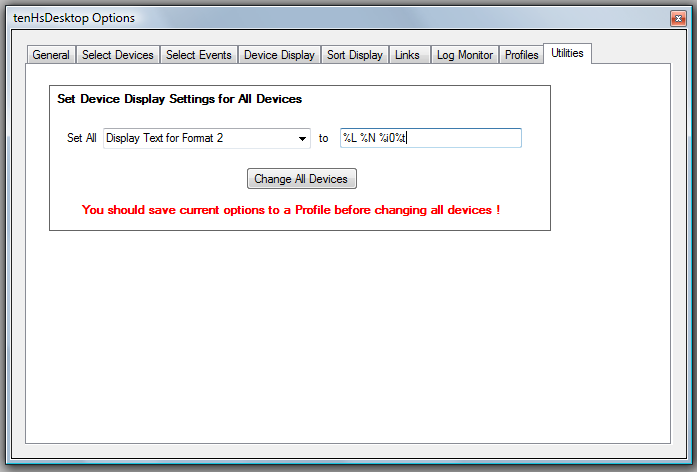 tenHsDesktop provides a set of defaults for each of the Display parameters for each Device. Devices that are ON will be displayed in Yellow, Devices that are DIM will be displayed in Gray and Devices that are OFF will not be displayed. The text that is displayed for each Device consists of its Name (%N), the default HS icon for the Device (%i0), and the default HS text for the Device (%t). These may not be the best default values for your installation -- resulting in you modifying each Device. The Options/Utilities tab provides the capability to change individual Criteria and Display parameters for ALL Devices -- essentially allowing your to change the default values. Set your own values for all Devices, and then proceed to modify individual Devices that do not fit your globally set values. Pick a parameter to set for ALL Devices, enter its value, and click Change All Devices. It is a good idea to first save the current values into a Profile via the Options/Profiles tab.